Dogpile Search Engine makes searching the Web easy, because it has all the best search engines piled into one. It is very safe for family and kids because very strict in search results. 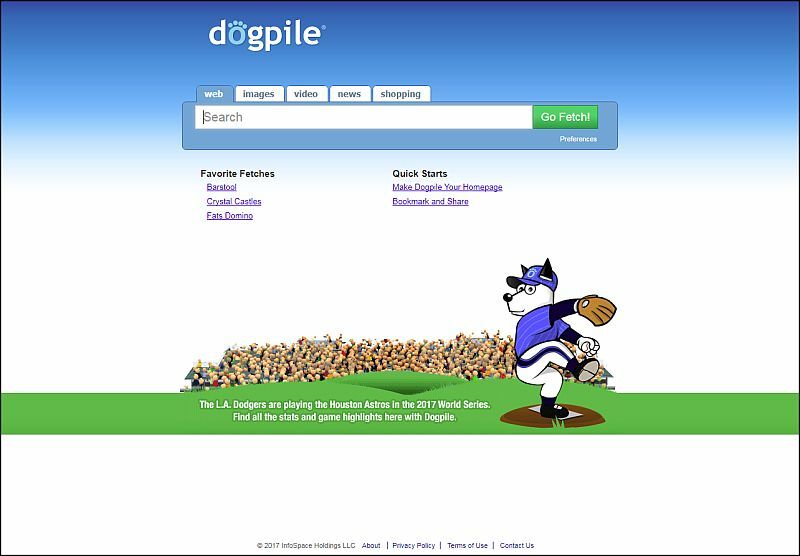 Dogpile is a metasearch engine, meaning that it gets results from multiple search engines and directories and then presents them combined to the user. Dogpile currently gets its results from Google, Bing, Yandex, DuckDuckGo and more. According to Dogpile, their metasearch technology “can search 50% more of the Web than any single search engine”, as evaluated by an independent search engine expert who verified their methodology and validated that their metasearch technology can retrieve 50% or more additional results. Users will see Arfie on the front page. The homepage is relatively clean and uncluttered, with a good choice of colors. The search bar is squarely in the middle of the home page, with textual tab choices right on top of that. Below Arfie, there are links to the Toolbar, Joke of the Day, SearchSpy, a way to view either family-friendly or unfiltered real-time Web searches, Maps, Weather and an option to add Dogpile Search to your site. There’s also Favorite Fetches, with what looks to be the top six most searched for queries at any one time, although this list didn’t seem to be completely accurate (dog flu is a most searched for query?). You might find Arfie’s Most Wanted to be a better indicator of what was being searched for by the most people. A test search brought back results with combined results from the various search engines and directories that Dogpile pulls from, but there is another column to the right with the question “Are You Looking For…” that had much better search queries and subsequently better results. Users will notice buttons at the top of their search results, including “Best of All Search Engines”, “Google”, “Yahoo Search”, “MSN Search”, etc. Click on any of those buttons and search results will now highlight items that are specifically from that search engine in a column to the right. Dogpile’s Image Search brought back good results, including better search query suggestions. Audio Search test searches receive results from Yahoo Search, SingingFish, and more. Most of these audio results have a quick thirty-second preview, but quite a few of them were available full-length. The Video Search is also powered by Yahoo Search, SingingFish, and more, and was similar to the Audio Search in previews and full-length results. News Search is sortable by relevance and date, with search results returned from sources as varied as Fox News, ABC News, and Topix. The Yellow and White Pages searches are standard, with fields to search by business name, individual name, etc. Throughout all these various searches (except for the Yellow and White Pages), the ubiquitous “Are You Looking For” feature is always there, steering users to better-worded search queries. Dogpile’s Comparison Engines demo is a friendly introduction to how metasearch engines work, with a real-time Venn diagram to demonstrate how three different search engines (Google, Yahoo, and MSN), retrieve results, and how few of them actually do overlap. Advanced Search gives users the option to narrow your searches by exact word phrases, language filters, date, domain filters, or adult filters. There is also have the option to set search preferences, with the ability to customize default search settings. The ability to search several big search engines and directories at the same time is not only a time-saver, but it’s useful to compare results. One of the best features of Dogpile is the search suggestions because the Suggestions can be quite a lot better than what the average searcher can come up with.